In honor of today's solemn anniversary, this is my all-time favorite New York picture. This is my cousin Josh during our Thanksgiving trip to NYC in 1987. This photo was taken as we waited for the ferry to the Statue of Liberty. 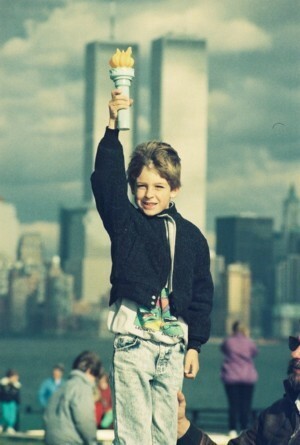 Seeing the World Trade Center juxtaposed behind a youthful Josh is so powerful to me. In the time since this photo was taken when I was in college, Josh has gone on to graduate from Georgia Tech and now has a successful business career. I now have a family of my own and am the proud father of two sons who both look an awful lot like Josh. Meanwhile, the Twin Towers have fallen, and our nation has endured countless challenges since we were attacked 10 years ago. Both of my sons have lived their entire lives in a nation that is perpetually at war. Wars that have cost our nation greatly in lives, treasure, and human spirit. Yet, despite our nation's challenges, when I look at this photo, and as I see my own children growing up, I realize that the strengths of our nation, of our people, and the grace of our Lord, are enough to help us move beyond the fear of 9/11 and beyond the violence that has followed. Hebrews 11:1 says, "Now faith is the substance of things hoped for, the evidence of things not seen." As we look upon the New York City skyline, we no longer see the World Trade Center, but with faith we can see the true greatness of America isn't found in our skyscrapers -- it's found in the unseen hopes and dreams of our children. For our country to truly be great, let's use the next 10 years to focus on helping all children achieve their dreams with the same steadfast commitment that we have pursued in demonstrating our military power for the past decade. On this anniversary, my thoughts and prayers go out to all those who perished and sacrificed on 9/11, and during the decade since. By God's grace, may our world now be filled with peace and the joy of children smiling at the prospects of a bright future.